Diatonic Scale: Day Z , Arma II mod. Multiplayer game, point of game is to survive as long as possible. Survival is very problematic. Players tend to create their own narratives. Day 5 : Sunrise. Probably hubris. On beach at Otmel. It's night, moving at night because less survivors and the Zs don't see very well. I have only a bandage and a flare. 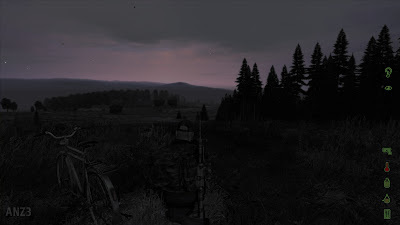 Run to Elektrozavodsk, watching out for bandits. Avoid the Zs. At the end of the day I have an axe, compass, assault backpack, knife, pistol and AK-74 with 4 magazines and two packets of antibiotics, the antibiotics are valuable because the Z's are infectious. Bandages. A lot of bad experiences with running. Take bicycles from stand outside school in Elektrovodsk and high tail it out of there. 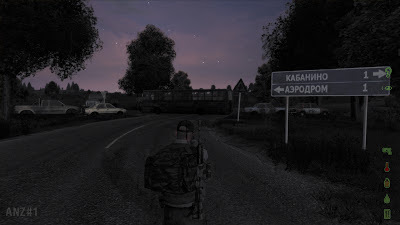 Stop by petrol station outside, north of Vyshnoye, logging out. It's night. The petrol stations cylinders I logged out nearby are on fire. First I thought it might be a helicopter, but no. Someone has been around. Hike towards Stary Sabor but end up running from a hoard of Zs, get lost and ended up near the coast. 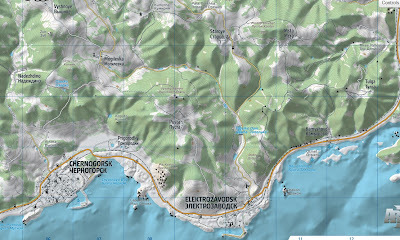 Take compass readings and head towards Chernogorsk. Two guys are yelling in side chat. We meet on road, they're friendly, although one of them points out how easy it would be to just shoot me and take my gear. Tense meeting, transfuse one of them. The three of us ride bikes to military airport, Balota, east of Chernogorsk. Over radio guy asks for medical help, guy comes out of airport. He is dressed as bandit, seriously consider wasting the bandit (Voodoo) but transfuse the guy. He is grateful, but it's the gratitude of a bandit. The Zs are problematic, we start using our firearms out of desperation, more Zs appear. 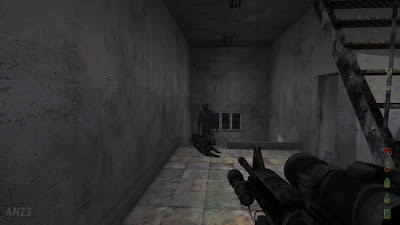 I aim the AK 74 assault rifle at an attacking Z, trying for a head shot, I miss at close range and it lashes out, I'm slow bleeding and infected. Fire several rounds into Z out desperation, it's a waste of ammunition. The bandit has gone, I think, I run into the forest, bandage myself and use one of my valuable antibiotics. Below my two partners are firing their guns, one is wounded and doesn't have a bandage. He is scavenging for a bandage in the airport hangers, it doesn't sound good. I try to help but end up attracting more Zs, so run back into the forest, towards Chernogorsk with the intention of losing the pursuing Zs. In the supermarket in Chernogorsk I find matches and taking a bicycle I head north along coast. I now have enough equipment to be able to feed myself without raiding the cities and towns. On the way I shoot a cow, just off the highway, and gut it using the knife and put the raw steak into my Survivors back pack. I stop by a petrol station with a bicycle stand, just north of Solnichniy. Over the radio the bandit (Voodoo) is asking where I am? I say "I'm finding a safe place and logging out". It's very early morning, I am in a forest overlooking a petrol station on a highway that is parallel to the sea. I walk down to the petrol station, grab a bicycle and making a compass reading start riding to Stary Sabor. On the way to Stary Sabor, near the village of Staroye, the server restarts (backs up). I am stranded on foot, making a compass reading I follow the main road south to Elektrozavodsk. Raiding the supermarket I don't find much, I still need a tent and a map (in game) and go inside a tavern, climbing up the stairs. I use most of a AK-74 magazine taking out the Zs that chased me inside. I make steady fire with mostly one shot head shots, because I am firing down a corridor and the Zs inside buildings move significantly slower. I bandage my wounds and eat some steak. Outside I can hear the fire of what sounds like an assault rifle, a dull crack, crack. Peeking through the window I can see a swarm of Zs following a survivor into a red brick house. I consider trying to make contact but I've had too many bad experiences in Elektrozavodsk and am feeling vulnerable. Upstairs in the tavern I log out, effectively hiding from the person below. It's daylight, but when I look outside the window I can still see the stars in the night sky. I go down stairs, quickly search the supermarket, eat the cans of tuna and baked beans that I find, then grab a bicycle from the school and high tail it out of Elektrozavodsk. 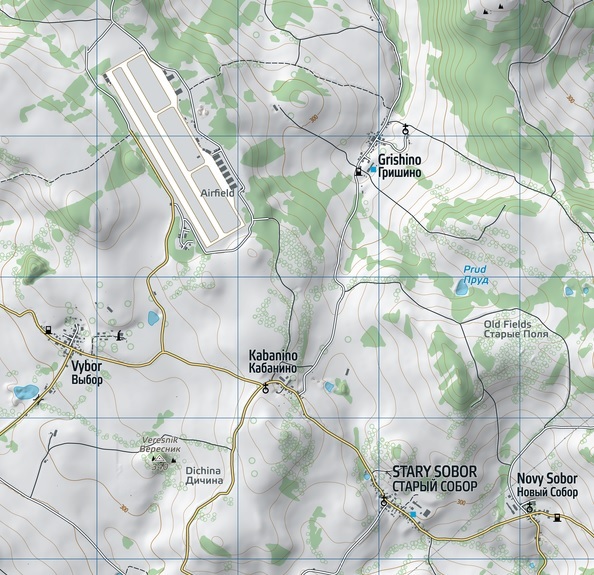 Heading north west and passing through Stary Sabor, I make it to the North West airfield that is just west of Grishino. The morning sunrise is actually pretty, one of the "rosy fingered dawns" of Homer. The North West airfield is a prime location for bandits, the chances of being sniped are high, crouching I search the control tower and find a M4A1 CCO assault rifle with a total of 4 SANAG magazines, it's rare and is useful for close combat but also has range optics. I wistfully leave my trusty AK-74 in the control tower with the remains of one magazine. Cycling to Grishino I find a petrol station with a bicycle stand to the south. I hide in some bushes nearby and log out. It's night, I creep to the bicycle stand and grab a bike and ride to the North West airfield. Climbing a control tower I run into a Z, I try for a head shot with my M1911 but miss, it lashes out and I am bleeding, I fire my entire clip and it goes down. I bandage and can hear the Zs below attracted to the sound. I take out the M4A1 and try for headshots as they come up the stairs, one by one. Its not perfect but the Zs are eliminated with less than a clip. My confidence in my M4A1 is decreased, the process was not as smooth as with my AK-74 but that could reflect my lack of familiarity. I find a G17 pistol with two clips, useful because it has a inbuilt torch. I crouch run to my bicycle that I've positioned for quick egress and start riding south. Over the radio a person called Jazz-Anon is asking for morphine, he has broken legs. He is at the North West airfield, barracks. I've got a total of 3 morphine cartridges on me, so I respond "I'm on my way, 10 minutes", as well as sort of whining "Please don't shoot me", ahem. When I get there, to the south of the airfield, he is standing, and Jazz-Anon is a bandit. It really irritates me that I am helping a bandit, I administer morphine and a blood bag, offer to trade sand bags and then bug out. He has a friends somewhere, they are talking over the radio and "Jazz" is a clan name. I've begun to learn where the petrol stations with bicycle stands are and so cycle to the north of Vyshnoye, before logging out. It's night. Creep to bicycle and head north. Stop In Stary Sabor. Head south towards Chernogorsk to gather medical supplies. 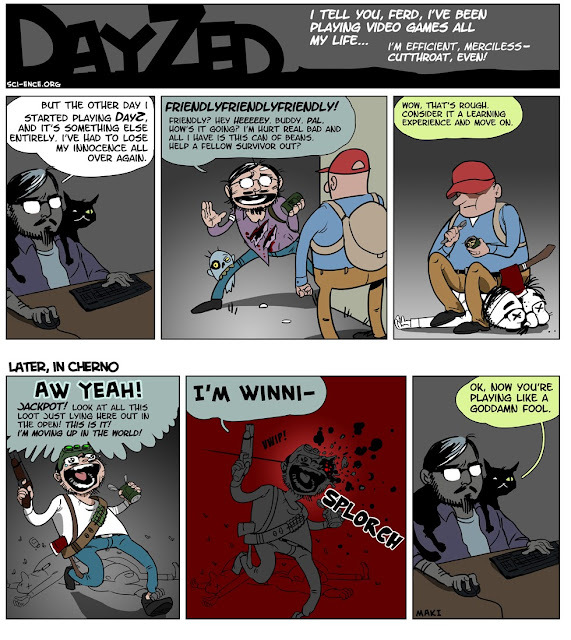 This comic pretty much says it all.